On 11-12 September, Eastern Partnership Civil Society Forum (EaP CSF) Working Group 1 “Democracy, human rights, good governance and stability” held their annual meeting in Brussels to discuss recent changes to the EaP architecture – as well as the upcoming Internal Reform, affecting the future of the Forum. There were also many chances to discuss latest developments in the wider EaP region, as well as the EU itself. The discussions started in a large, plenary-style setting before continuing in smaller groups, divided according to expertise and focusing on specific issues. These included a wide-range of topics: enabling civil society environment, Open Government Partnership (OGP), security, media and propaganda, justice, rule of law and corruption, as well as gender. What is more, members could choose one of the following training sessions: Advocacy and lobbying with Tinatin Tsertsvadze (International Partnership for Human Rights – IPHR), Monitoring the implementation of the AA with the EU with Iulian Groza (European Institute for Politics and Reforms Moldova – IPRE) or Effective messaging with Jeff Lovitt (New Diplomacy). 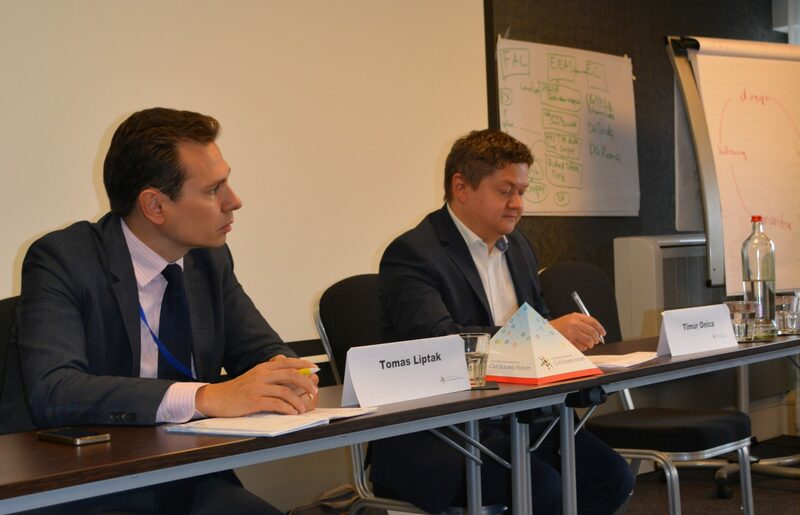 On the side of the meeting, EaP CSF organised a joint panel discussion on Armenia, entitled “Securing the revolution – the role of civil society and reform challenges in Armenia”, which took place on 10 September at the European Endowment for Democracy (EED) office in Brussels. During the next two days, some Armenian WG1 members participated in a number of advocacy meetings with the EC, EEAS and other EU stakeholders, and briefed Council Working Party on Eastern Europe and Central Asia (COEST) and Council Working Party on Human Rights (COHOM) at the Czech Permanent Representation to the EU, in a session opened by Czech Permanent Representative to Political and Security Committee (PSC), HE Ambassador Tomas Szunyog. The plenary opened with an address from WG1 Coordinators, Haykuhi Harutyunyan and Krzysztof Bobinski. Both stressed the importance of the Internal Reform, particularly in the context of EaP’s multilateral format and the expectations put before the Forum. In this context, Bobinski (Platform 1), Abraham Artashesyan (Platform 1 PAR – Public Administration Reform Panel), Lilia Carasciuc (Rule of Law Panel) and Hennadiy Maksak (CSDP – Common Security and Defence Policy Panel) shared their experiences of participating in EaP Platforms and Panels. Among other questions, the floor was particularly interested to hear more about the role of EU members and their representation in EaP CSF’s formal structures. 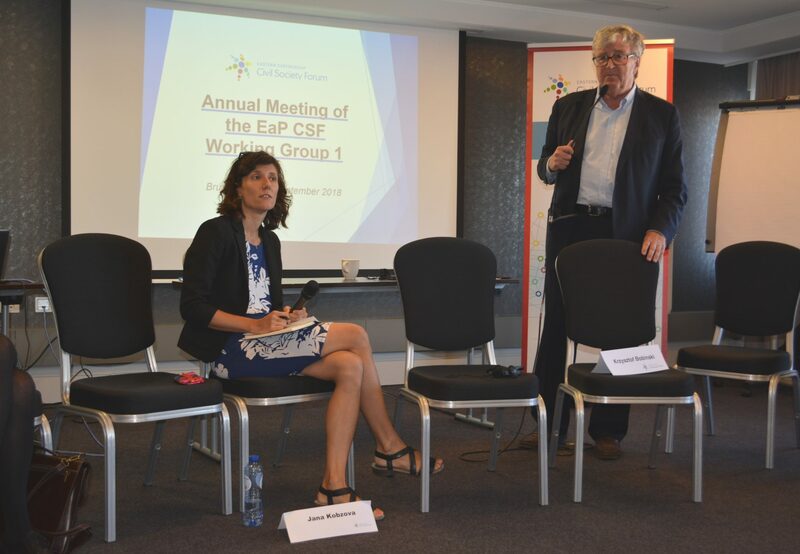 The open session ended with a discussion between Bobinski and Jana Kobzova (Rasmussen Global), who briefed members on recent developments around EaP not in Brussels, but also elsewhere in Europe. Kobzova was keen to highlight that the nature of EaP as a policy initiative is changing, with political priorities rapidly shifting in many EU member states. Breaking into smaller groups, members had a chance to come up with their set of recommendations – which were then presented to external stakeholders. 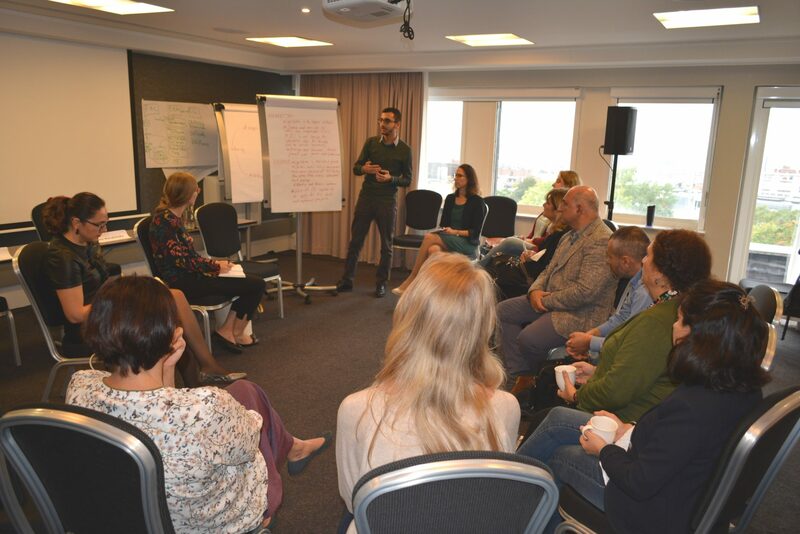 The group focusing on enabling environment for civil society discussed the situation in each EaP country, with the aim of devising a coordinated, strategic approach. Addressing Sinziana Poiana (DG NEAR) and Marta Wytrykowska (EEAS), members stressed the need for more transparency and sustainability, as well as more political and financial support for civil society in EaP countries. The recommendations for OGP were based around inclusion of OGP commitment, together with the 2020 Deliverables, particularly those on strengthening institutions and good governance. Members of EaP CSF National Platforms and Working Groups should take a more active role in promoting open government principles, which would grant them greater leverage in terms of advocacy and access to resources, such as the OGP Multidonor Trust Fund. In conversation with Sandra Pernar (OGP Brussels Office) and Giorgi Kldiashvili (OGP Civil Society Steering Committe), members suggested to tighten cooperation with OGP locally. Recommendations on security are split between the three Association Agreement countries (Georgia, Moldova and Ukraine) and the rest (Armenia, Azerbaijan and Belarus). As for the first group, members highlighted the need go beyond cooperation and gradual integration. There needs to be a tailored EU-NATO-EaP cooperation strategy, is one of the group’s findings. More general recommendations for Radoslaw Darski (EEAS), who was present at the meeting, include: creating an alerting system on security threats, as well as a multilateral mechanism for protection of critical infrastructure, especially in trans-border regions and wider focus on cyber-security. Media and propaganda recommendations focused on better coordination and creating sustainable relations, particularly with donors. This was taken up by Timur Onica (European Endowement for Democracy – EED), who pointed to adequacy of donor support, which is often failing on the ground. Another question was the possibility of small grants for journalists and independent media. Tomas Liptak (Permanent Representation of the Czech Republic to the EU) offered his support to these messages and highlighted the need for further technical support. Group recommendations of justice reforms, rule of law and corruption stemmed from an analysis of the indicators developed by the European Commission for the Efficiency of Justice (CEPEJ) of the Council of Europe. The indicators should be more comprehensive and go beyond assessing courts – not only with an exclusive focus on quantitative indicators. Most of the points addressed to Jan Petry (DG JUST) concerned how can we evaluate the efficiency of the judicial system, while capturing progress made by EaP countries. The members looking at gender, a cross-cutting issue within 2020 Deliverables, took a close look at the existing three gender-oriented re-granting projects. Some of their recommendations are to develop a pool of experts on gender issues and give more visibility to policy work on gender in the EaP countries. Listening to the contributions, Josefin Emanuel Brattberg (DG NEAR) supported the idea of showcasing more projects on women’s representation, violence against women and socio-economic rights of women from the region. The meeting closed in plenary-style with a short answer and question session on the Internal Reform, featuring Harutyunyan and Bobinski. Members also commented on the meeting’s format and the ability to raise concerns directly with involved stakeholders. 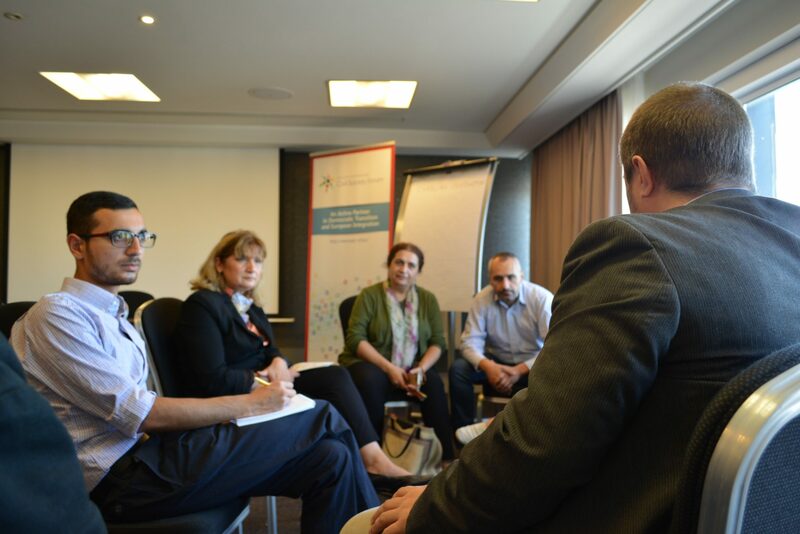 Planning ahead, WG1 is planning to reconvene at the 10th Annual Assembly in Tbilisi, Georgia (10-12 December 2018).